Particulate matter (also called PM or particle pollution), one of the EPA criteria pollutants, is a complex airborne mixture of solid particles and liquid droplets. Though PM ranges widely in size, it has been divided into two categories based on diameter. 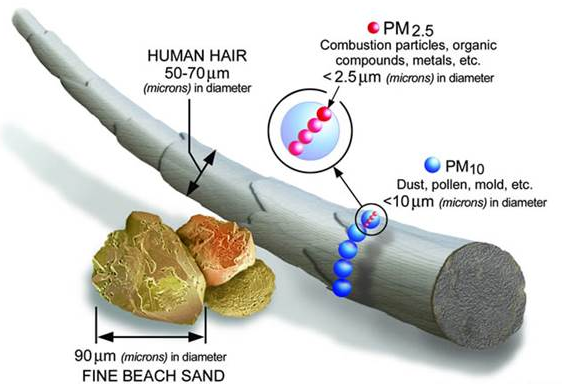 Both regulated classes of PM (PM2.5 and PM10) are extremely small; the average human hair is approximately 70 µm in diameter, nearly 30 times larger than the largest PM2.5 particle (Figure 1). Exposure to both ‘fine’ (PM2.5) and ‘coarse’ (PM10) particles is associated with a number of harmful health effects, particularly those involving the heart and lungs. In general, the size of the particles is directly linked to their potential for causing health problems. 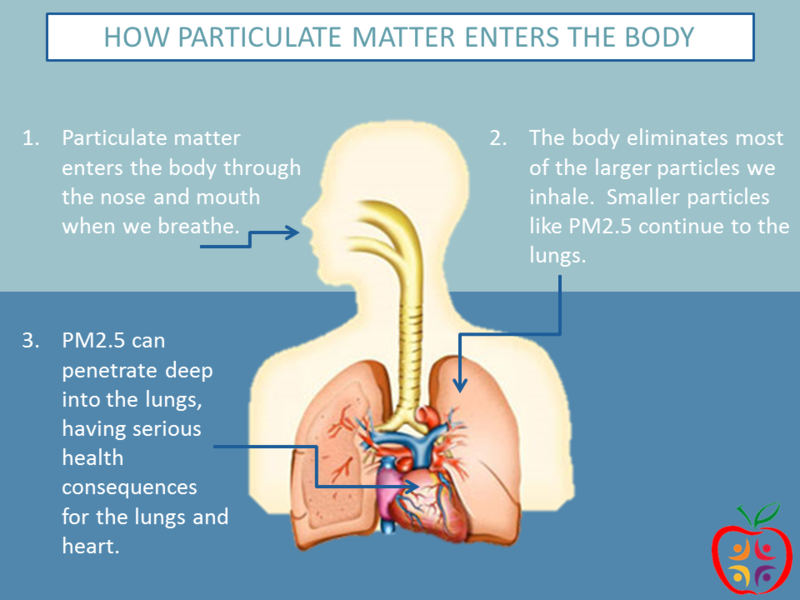 Smaller particles (e.g., PM2.5) are most dangerous as they can easily get deep into the lungs. They can enter the circulatory system or remain embedded for long periods. These cardiovascular and respiratory health effects can increase doctor and emergency room visits, hospital stays, absences from school and work, and deaths. Nationwide, studies have shown a 15% decrease in the risk of heart disease deaths with every PM2.5 decrease of 10 micrograms per cubic meter of air (µg/m3). Particle pollution has also been associated with lung cancer and adverse birth outcomes, such as low birth weight and preterm birth (CDC, 2013; Shah et al., 2011; UDOH, 2014a). The likelihood of being affected by PM increases as more time is spent outdoors during periods with high PM levels, and as more strenuous activities are performed. PM levels can also be elevated indoors, particularly when outdoor levels are high (EPA, 2014f). Certain air filters can help reduce indoor PM. See the EPA's Guide to Air Cleaners for more information. PM is composed of many different compounds and chemicals, including soil, dust, salts, acids, soot, metals, and organic chemicals. When thinking about where PM comes from, it is again divided into two categories. Primary Particles: Released directly from a source. Some of the most common sources include smoke and soot from fires, fuel combustion (both industrial and residential), industrial processes, and dust from many different places. Secondary Particles: Formed in complex reactions involving other atmospheric pollutants like nitrogen dioxide and sulfur dioxide. The majority of PM2.5 pollution is comprised of secondary particles, both nationally (EPA, 2013i) and within Utah (UDAQ, 2014h). Over 30% of primary PM2.5 particle emissions in Utah also came from dust in 2011 (Figure 2) (EPA, 2016a). Fires contributed over 15%, while fuel combustion and mobile sources emitted 15% and 12.5% of the total primary PM2.5 particles, respectively. Remember that this graph shows only primary particles, those release as particles directly from a source. Most PM2.5 is made of secondary particles, those formed in the atmosphere from other pollutants. In 2014, 67% of the primary PM10 particles in Utah came from dust, largely from unpaved roads (Figure 3) (EPA, 2016b). The next highest source categories, agriculture and industrial processes, contributed approximately 17% and 5%, respectively, of the total primary PM10 particles. Remember that this graph shows only primary particles, those release as particles directly from a source. There are three primary National Ambient Air Quality Standards (NAAQS) for particulate matter, which were most recently revised in 2012. There is an annual primary standard for PM2.5 of 12 µg/m3, and PM2.5 and PM10 have 24-hour primary standards of 35 µg/m3 and 150 µg/m3, respectively. Since weather conditions play such a large role in the data collected year to year, each of the three standards are evaluated over rolling three year periods. 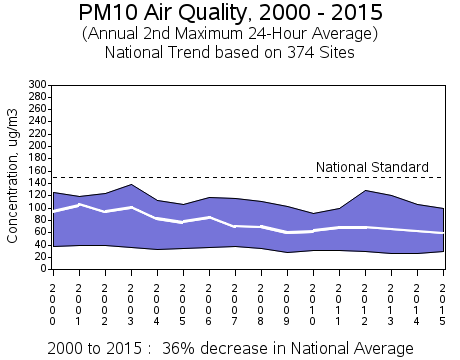 The PM2.5 24-hour primary standard is the 98th percentile averaged over three years, while the PM10 24-hour primary standard is not to be exceeded more than once per year on average over a three year period (EPA, 2013j). 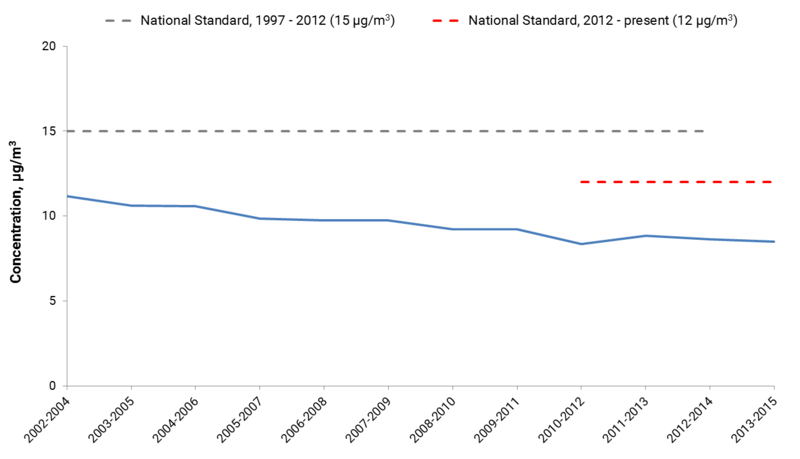 Nationally, both PM2.5 and PM10 levels have shown steady reductions between 2000 and 2015, decreasing by 37% (Figure 4) and 36% (Figure 5), respectively. 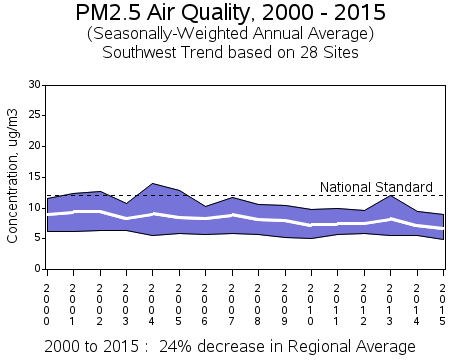 The Southwest region states of Arizona, Colorado, New Mexico, and Utah have shown less improvement over the same time period, with a 24% decrease in PM2.5 levels (Figure 6) and a 16% dcrease in PM10 levels (Figure 7). 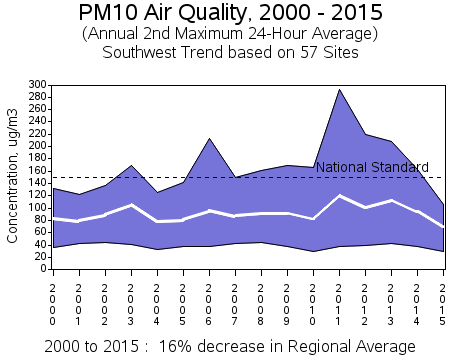 However, part of this trend is due to a spike in PM10 levels among some Southwest monitoring sites in 2011 – 2012, and regional PM2.5 levels already being below the national average in the early 2000s. The PM2.5 level averaged across 18 air quality monitors throughout the Wasatch Front (including Brigham City and Logan) is shown in Figure 8. The average 24-hour PM2.5 concentration consistently exceeded the current 24-hour NAAQS (first enacted in 2006). The average concentrations from most individual monitors were also consistently above the 24-hour NAAQS (data available from UDAQ). 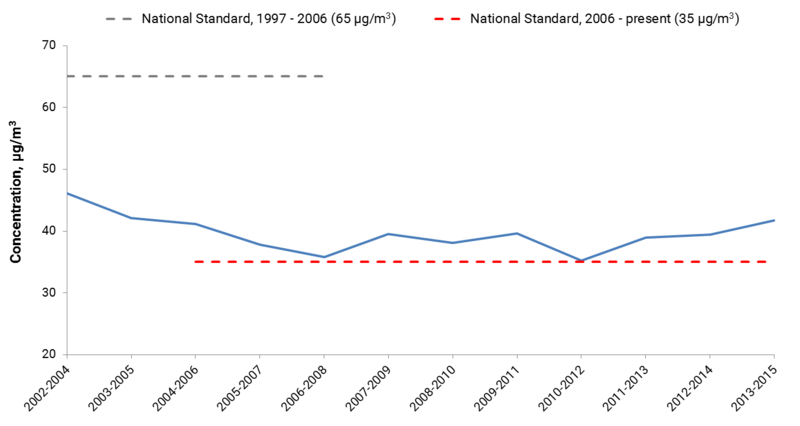 By contrast, the annual mean PM2.5 concentration averaged across the same 18 air quality monitors has consistently been below the annual NAAQS of 12 µg/m3 since at least the 2002 – 2004 three year period (Figure 9). The annual mean concentrations from most individual monitors were also consistently below the annual NAAQS (data available from UDAQ). 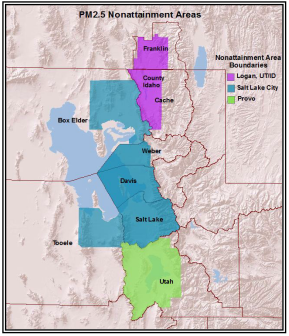 There are a number of areas in Utah that have been designated as nonattainment for PM by EPA under the most recent NAAQS. 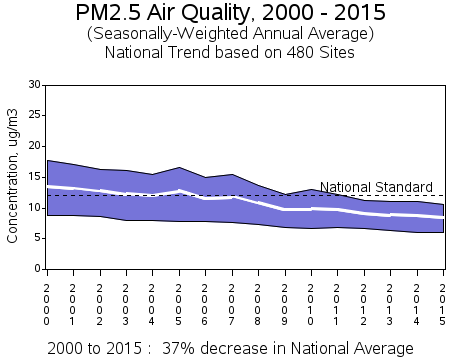 All areas in Utah were attaining the 1997 PM2.5 24-hour primary standard of 65 µg/m3. However, when this standard was lowered to 35 µg/m3 in 2006, the urban areas along the Wasatch Front were unable to comply and were re-designated as nonattainment (Figure 10). 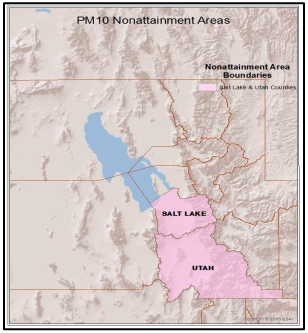 For PM10, Salt Lake and Utah Counties have been designated as nonattainment for the 24-hour primary standard of 150 µg/m3 (Figure 11). In general, both areas have been in compliance with the NAAQS since 1996, but disagreements regarding the classification of exceedances due to windborne dust during high wind events have prevented re-designation to attainment or maintenance (EPA, 2009; UDAQ, 2014f). The Utah Environmental Public Health Tracking Program (EPHT) has created a number of indicators exploring data on particulate matter in Utah. An indicator is a fact or trend that indicates the level or condition of something. Well known indicators include gross national product, unemployment rates, and presidential approval ratings. In a public health context, indicators show trends like cancer rates, drinking water contamination levels, and blood lead levels in children. Visit the EPHT frequently asked questions page for more information.